Employers who abuse domestic maids in cases of simple hurt may face longer jail terms in a new move by the court to raise deterrence. Chief Justice Sundaresh Menon gave notice of the direction the court was moving in, in dismissing the appeal of a convicted offender jailed for 14 weeks for the "wanton bullying" of a maid. The lawyer for Janardana Jayasankarr, Mr Rajan Nair, had argued that his client's 14-week jail term for punching and stamping on his maid was "manifestly excessive", according to precedents. But the CJ disagreed, saying: "In all the circumstances, I consider the sentence in this case could have been even higher." He also said in his judgment grounds, released yesterday, that this area of sentencing should be reviewed, given an appropriate case. Malaysian Chong Yee Ka, 32, a permanent resident, punched Myanmar maid Aye Moe Khaing, 27, in the face - among various forms of abuse - at her Rivervale Walk flat. Chong was sentenced to three weeks in jail on two counts of maid abuse. Ng Tong Kok, 59, a part-time cleaner, hit his 33-year-old Indonesian maid Warda with a walking stick, and punched and kicked her. Found to be suffering from a major depressive disorder, he escaped jail time and was given a two-year treatment order to get psychiatric help. Li Guizhen, 64, injured Myanmar maid Nwe Ni Hlaing, 30, by kneeing the victim in the chin. Ms Nwe Ni Hlaing was kneeling before Li, who was visiting her daughter from China, to apologise for her mistakes at work. Li was sentenced to a week in jail. 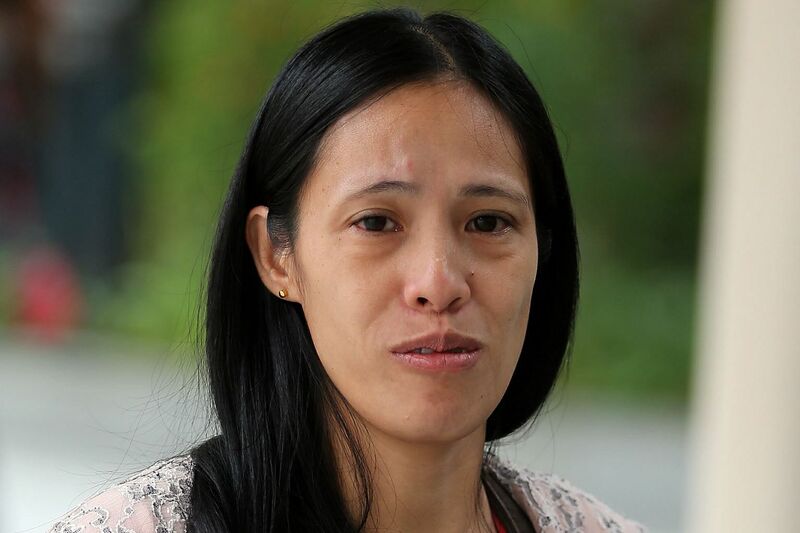 Filipina Thelma Oyasan Gawidan (above), now 40, was denied food and not allowed to go out of the house by her employers Lim Choon Hong, 47, a freelance trader, and his wife Chong Sui Foon, also 47. Madam Gawidan weighed just 29.4kg when she finally escaped in April 2014. Lim has pleaded guilty to a charge of contravening the Employment of Foreign Manpower (Work Passes) Regulations 2012, which requires employers to provide adequate food and medical treatment for their maids. Chong has also admitted to a count of abetting Lim in committing the offence, which carries a maximum punishment of 12 months in jail and a $10,000 fine. The couple has not been sentenced. Simple hurt draws a maximum jail term of three years, unlike grievous hurt, which is 15 years. Janardana, 52, had pleaded guilty in February to two counts of assaulting Filipina Miezel Cagas Limbaga, 31. In the incidents which occurred last year, Janardana, a security guard, had stamped on and punched Ms Limbaga after accusing her of stealing food. She was left with bruises on her scalp, cheeks, chest, back and hip. Janardana and his wife Vidya Jayasankarr, 32, who was jailed for a week, had taken turns to hit her. District Judge Jasvender Kaur jailed Janardana for seven weeks consecutively on each charge, taking two others into consideration. Mr Nair had asked for the sentence to be cut to eight weeks, as the individual term of seven weeks for each charge was not in line with previous cases. But CJ Menon said the "real issue" in the case was the severity of the assaults and the injuries suffered. He noted there were repeated assaults with "no comprehensible trigger" on the vulnerable areas of the victim's body. It had reached a point where she was afraid even to be seen talking to other persons. He said: "I consider this as a serious instance of abuse. Domestic helpers cannot become an outlet for a frustrated employer to vent his or her personal frustrations. They are human beings entitled to be accorded due dignity and respect because the human condition demands it." Noting that the law provides for a maximum of three years in jail and $7,500 fine for offences of simple hurt, he said the precedents showed the courts may not have sufficiently taken into account or utilised the breadth of the sentencing range prescribed by Parliament. He said the court would take an appropriate case in the future to calibrate "the applicable benchmarks upwards" and spell out the factors to consider when sentencing. Industry players hailed the CJ's move, pointing out that stiffer jail terms would prompt employers to think more before they act. Ms Shirley Ng, the owner of Orange Employment Agency, said it was a strong message being sent from the court. Government Parliamentary Committee (GPC) for Manpower chairman Patrick Tay added that foreign maids needed protection as they are more vulnerable, working long hours in an environment out of the public eye. He said: "This is unlike service staff, or those who work in office or public premises where there are witnesses." Foreign Domestic Worker Association for Social Support and Training (Fast) executive director William Chew suggested that other measures, such as assessing the employer's suitability, also had to be considered.